High Tatras or High Tatra (Slovak and Czech: Vysoké Tatry, Polish: Tatry Wysokie) are a mountain range on the borders between Slovakia and Poland. They are a part of the Tatra Mountains. The High Tatras, with their 17 peaks over 2500 m AMSL, are, together with the Southern Carpathians, the only mountain ranges with an alpine character in the whole 1200 km length of the Carpathian Mountains. The mountain range borders Belianske Tatras to the east, Podtatranská kotlina to the south and Western Tatras to the west. The major part and all the highest peaks of the mountains are situated in Slovakia. 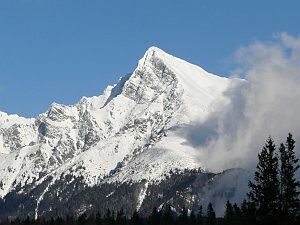 The highest peak is Gerlachovský štít at 2,655 m. Many rare and endemic animals and plant species are native to the High Tatras. Large predators, such as the bear, Eurasian lynx, marten, wolf and fox live there. The area is well known for winter sports. Ski resorts include Štrbské pleso, Starý Smokovec and Tatranská Lomnica in Slovakia and Zakopane in Poland. The town of Poprad is the gateway to the Slovak Tatra resorts. The first European cross-border national park was founded here—Tatra National Park—Tatranský národný park in Slovakia in 1948 and Tatrzański Park Narodowy in Poland in 1954.